Time — the insanity of time. Going to Copa de Dillon in a few minutes to celebrate an extraordinary life, that was far too short. 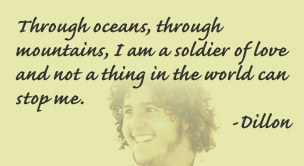 Sending love to all who love Dillon as we continue to remember his joy, his passion and his exuberance about life.